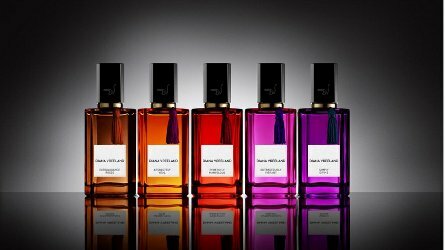 Diana Vreeland, the well-known editor of Harper's Bazaar and Vogue (she died in 1989) will have a new line of fragrances in her name. The brand was created by her grandson, Alexander Vreeland, who also recently published Diana Vreeland Memos: The Vogue Years. The five fragrances — Extravagance Russe, Absolutely Vital, Perfectly Marvelous, Outrageously Vibrant and Simply Divine — reportedly feature "vibrant" top notes that echo Vreeland's "distinct style". They will launch before this year's New York Fashion Week (in September). In France, they will be exclusive to Colette. I will update with more information when I can. Update: here are descriptions from Neiman Marcus, where the scents are now available for pre-order. Extravagance Russe ~ developed by perfumer Clément Gavarry. "Extravagance Russe by Clement Gavarry was created as an homage to Mrs. Vreeland's love of Orientalism. Capturing the essence of amber's sacred and mystical note in perfumery, the fragrance goes deep into the collective olfactive memory. It maintains the original codes of amber within a contemporary structure. The scent harmoniously wraps luxurious resins and balsams with precious vanilla bourbon and musk for an enhanced impression of skin like and captivating sensuality." Absolutely Vital ~ developed by perfumer Yves Cassar. "Absolutely Vital, created by Yves Cassar, uses the highest quality natural ingredients from LMR, IFF's facility based in Grasse, France, to create this ode to Mrs. Vreeland's love for India and passion for sandalwood. A mysterious and enveloping woody composition of Indian sandalwood. This precious and refined wood is wrapped in a silken floral bouquet of Turkish rose and jasmine absolute from Egypt and softened with enveloping balms of myrrh resin and opoponax resin. Finished with nuances of vanilla, the skin is caressed in a warm veil of opulent sensuality." Perfectly Marvelous ~ developed by perfumer Céline Barel. "Celine Barel was inspired by Mrs. Vreeland's quote, "If it isn't a passion, it isn't burning, it isn't on fire, you haven't lived!" to create Perfectly Marvelous. The end result is an unforgettable fragrance, built around a lacquered red sandalwood pimento accord, draped in a daring Jasmine bouquet. Capturing the audacious spirit of Diana Vreeland and inspired by her favorite color, this fragrance is a passionate fragrance, built around a jasmine absolute from India, draped in a "glowing lava" accord of lacquered red sandalwood and pimento. Heady, elegant and voluptuous, jasmine sambac lends a glossy quality to the composition while evoking utmost eroticism. Cashmeran, a musk that evokes fire, combines with a mix of spices and resins for a crackling effect." Outrageously Vibrant ~ developed by perfumer Carlos Benaïm. "Outrageously Vibrant by Carlos Benaim is the culmination of over two years in creating a red and slightly gourmand Eau de Parfum. A fearless, nonconformist fragrance combining a classical chypre structure with an unexpected twist of "creme de cassis." The richness of patchouli and sophistication of the rose bouquet are contrasted with the electric, saturated and exuberant facets of cassis to create a bold, daring and contemporary trail." Simply Divine ~ developed by perfumer Clément Gavarry. "Simply Divine by Clement Gavarry is an ode to the unique beauty and complexity of the iconic tuberose flower. The fragrance authentically magnifies the opulent lactonic nectar of tuberose with its natural, green "crushed leaves," freshness, and a wink of nutmeg. To reveal the exceptional beauty and luminous expression of the tuberose, the majestic heart develops captivating notes of lush orange flower absolute from Tunisia and jasmine absolute from Egypt. The background enhances the mysterious and seductive signature. The depth of Indian sandalwood is softened with elegant accents of Orris, Italy, enveloping cashmere woods, balsamic nuances of tonka beans, and sensual musk to caress the skin in a warm veil of luxurious sensuality." The collection is available in 50 ($185) or 100 ($250) ml Eau de Parfum. Hmmm … I really like the clear bottles and colorful juice. Wouldn’t it be nice to have a vibrant pink perfume that smells sophisticated? I will choose to be optimistic about this! Her granddaughter (by marriage, I think) did such a great job with the film; hoping her grandson does similarly excellent work! Did not know, or forgot, that her granddaughter made the film…great movie. I hope they are really bold and glorious. I can’t wait to try them. Great names to announce when you are asked what fragrance you are wearing. The family seems driven to keep her name alive. I wouldn’t want her voice in my head for making a misstep! Agree, great names, would have to have her memory associated with wimpy or bad fragrances. OH MY! Diana is one my heroines and I love how during one the 70’s Met Costume Gala which was themed on Russia, she permeated the place with Cuir de Russe fuming from the airvents! I adore Diana Vreeland, but a trend of posthumous celebrity scents would really worry me. Yes. I think they should stop w/ the Elizabeth Taylor scents too. I agree… We’d get Nat and Natalie’s duet of femme and homme cologne’s Unforgettable…. Or Francis Bacon’s three studies of water, pur parfum…. I smelled absolutely vital and simply divine today and liked them both. Seems like a winning line to me. The bottles are uniquely colored and a classic style. I never really liked a perfume off of those samples, but this one struck me as … special. I was intrigued! I will seek it out. Outrageously Vibrant is amazing! When I wear it, people always ask what it is and ask where they can get it. Fantastic perfumes made in the USA but the ingredients are from Europe and are bottled in the same manufacturing plant as Chanel perfume bottles.